It's been a good year for Nederland artist Max Krimmel. From June 1999 until June 2000 one of his lathe-turned alabaster vessels is on display at the Smithsonian Institution's Renwick Gallery in Washington, DC, The Renwick houses the contemporary Craft Collection of the National Museum of American Art, and Krimmel's piece is now a permanent part of the Smithsonian collection. Another piece of his alabaster work went on display at the Los Angeles County Museum of Art. This piece is scheduled to be shown until July 2000. This was not Krimmel's first time to be on exhibition in the Renwick: his work's first appearance was in the form of a guitar which was one of a hundred instruments handmade in the US selected to be part of the Smithsonian's 1979 exhibit, "the Harmonious Craft: 20th Century Musical Instruments." Krimmel's life as an artist began early. At age 8 he won a prize for a Halloween Kachina costume including a spectacular Max made headdress, leggings and moccasins. Another early recognition of his work came at age 12 when he won first, second and third places in a 1960 Denver model car contest. His entry was a reproduction of a maroon woody surfer wagon with velvet curtains and operational door handles (still a family heirloom), and two similarly outrageously appointed reproductions. Says Max, "As an adult, I haven't been able to repeat that act of sweeping all the places in a competition." no prize for that one. A few Halloween costumes and model cars later, and Max's mother realized his interest wasn't necessarily Indians or cars; rather he liked making things, all sort of things. Close on the heels of the model car phase, Krimmel learned to play the guitar, and once again he found himself as interested in the process of making the instrument as in playing it. He enrolled in a class called "Build Your Own Peach Box Guitar." After that first guitar there were just a few innovations he wanted to try out, so he built another. This second effort turned out not to be entirely perfect either, and so he built a third. This third guitar he sold, and that turned out to be a big career turning point: it was the end of his job at Henry's Hamburgers as well as the end of any job other than being an artist. Krimmel has now been making his living as an artist for 35 of his 51 years. Between 1965 and 1982 he built 167 guitars. They were bought by such notable musicians as Jerry Jeff Walker, Stephen Stills, David Bromberg, Bob Shane (of the Kingston Trio), and Colorado favorites Carla Sciaky, Mary Flower, and Chuck Pyle, not to mention Krimmel's partner of 30 years and Nederland musician, Bonnie Carol. Jazz guitarist Al Dimeola as well as the group Supertramp used Krimmel guitars on albums which were recorded at the Peak to Peak areas own Caribou Recording Studio. During the guitar building era, a friend asked to store a wood lathe in Krimmel's ample wood shop, Strictly as an avocation, Krimmel used the idle lathe to turn stunning laminated wooden bowls from guitar scraps. These vessels made their way under many a special friend's Christmas tree. Max had been working in turned wood for several years when in 1986 he happened upon a short demonstration of turning alabaster. By 1988 he was turning alabaster himself and sent slides to an international lathe work competition. It was a prestigious show in which any lathe artist would be proud to participate and Krimmel had five pieces accepted, two of wood and three of alabaster. "I didn't know they were THAT good," and another career shift took place. He moved from guitar builder to professional lathe artist. Regardless of the particular medium in which Krimmel currently works, there are some similarities in his approach. His artistic goals include smooth and graceful lines, classic simplicity, delicacy and formality of design. Aesthetic questions such as experimentation with the smallest noticeable change, "the threshold of difference," as he terms this artistic question have caught his interest. Krimmel loves things that are difficult and meticulous. "In my 20s, I made joints in bindings and mother of pearl decorations on guitars that my 50-year-old eyes can hardly see." His bowls show the same aesthetics, very thin, feather light work, with never the remnant of a chisel scrape or a sand paper scratch in the highly polished, translucent pieces. He strives to produce forms that are not culturally reliant: beautiful to all viewers regardless of the cultural context or the times. The care Krimmel shows in his work puts the vessels in high demand, commanding prices from $500 to $10,000 in elegant art galleries from coast to coast, including Boulder's Master Goldsmiths. Dale Nish, one of the movers and shakers in the renaissance of contemporary lathe work, says of Krimmel's work, "In this level of craft, he is without peer in the world." American Woodturner wrote of one of Krimmel's vessels, "To say it is a beautiful piece is to state the obvious. To recognize how, by being beautiful, it transcends ordinary expectations of the material and this process is to begin to understand the meaning of crafting beautiful things." Krimmel's works are now in the collections of Boeing Aircraft, the Hoyt Institute of Art in New Castle PA, the Denver Art Museum ,the Frick Collection as well as the Smithsonian and the Los Angeles County Museum of Art. There are a number of credos by which Krimmel actually lives his artistic life. On the subject of working at home he is often heard to say, "as long as we are home relaxing a bit, we may as well get some work done." And on the topic of self employment, "working for yourself is great; you can work as much as you want, as long as it's all the time." And what is the current project? Max designed and built a bass marimba this fall. He plays in a marimba band, and once again, seems as interested in making the instruments as playing them. And like lathe turning in 1985, marimba building is still an avocation. You can see Krimmel's version of the history of his artistic endeavors on his web page, www.MaxKrimmel.com. What is alabaster, what is a lathe, and how do they figure in art history? Alabaster is a crystalline form of gypsum or calcium sulfate, which is the main ingredient in sheet rock. The alabaster itself is pure white, and the other mineral impurities are responsible for its subtle colors ranging from translucent white through pink to brown, gray, yellow, and green. Fort Collins, Colorado sports one of a dozen alabaster quarries in the world, and Max has become a regular customer at Colorado Alabaster Supply. A lathe is similar to a potter's wheel except that the axis is horizontal rather than vertical, and the process is completely subtractive. The lathe holds work in position and turns it fast enough that a cutter or scraper can be used to remove material and thus develop the shape of the piece. Among the artifacts in the 3,000-year-old tomb of Ramses II there is an alabaster vessel that appears to be turned. A thousand years ago the aristocracy of England had death masks carved of alabaster. This material was ideal for the masks because its softness made it possible to carve the mask quickly before the burial ceremonies commenced (talc is a hardness rating of one, your fingernail is about hardness two, diamonds are ten and alabaster is rated two and a half). A more pedestrian use of Colorado alabaster was made during the Depression by turners who made ashtrays, night-lights and other tourist items. 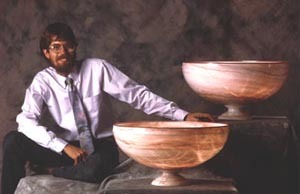 Little use was made of alabaster in the craft of turning until 1989 when Krimmel described the development of several unique techniques including the use of a vacuum to secure the stone to the lathe and the use of a wood rim and base which adds structural integrity to the vessel allowing a much larger and thinner turning to be made. Most contemporary alabaster turning in the US can be traced to this article.